With the SL-centric news on TPV policy changes, it was easy to miss the announcement that vehicle sim crossing capabilities have been rolled-out to the Avination Grid. I actually caught the new through Maria Korolov’s ever-excellent Hypergrid Business News. Avination is the first Grid beside Second Life advanced to the point to offer cars, ships and other vehicles driving across sim borders. “Breaking down the borders and crossing them!” Avination literally made just that possible for it’s residents. With the latest rollout of its server software Avination became the first grid beside Second Life to allow residents to explore their world using cars, ships, bikes or horse pulled carriages. The days where one could only cross sim borders hiking or flying or needed a TP to get somewhere else are over. Whether Avination was the first outside of SL is debatable. InWorldz may equally lay claim to that honour. However, sim-crossings are now available on Avination. In discussing the roll-out with Hypergrid Business, Melanie Thielker, CEO of both Avination and hosting company 3D Hosting said, “We have worked continuously to improve vehicle physics and we have a good driving feel as it is,” she said. “However, we have also just started a complete revamp of vehicles with the aim to get even closer to Second Life behavior. At this time, Avination supports most of the API [application programming interface] and most values match or need only minor tweaks.” This essentially means that scripts that currently work in SL should work on Avination with minimal revision. The capability will initially be proprietary to the Avination grid, but will eventually be released to the OpenSim community as a whole, in keeping with Avination’s policy of supporting the OpenSim community, in which it has its roots and strong ties (Thielker is one of the core OpenSim developers). To mark the roll-out, Avination will be hosting a cross-sim race, sponsored by VirWox, the Austria-based virtual currency exchange and backer of the multi-grid Open Metaverse Currency (OMC), and organised by M Events, a Dutch marketing company which invested in Avination at the end of last year. Details of the race have yet to be announced, and I’ll endeavour to report them when known. 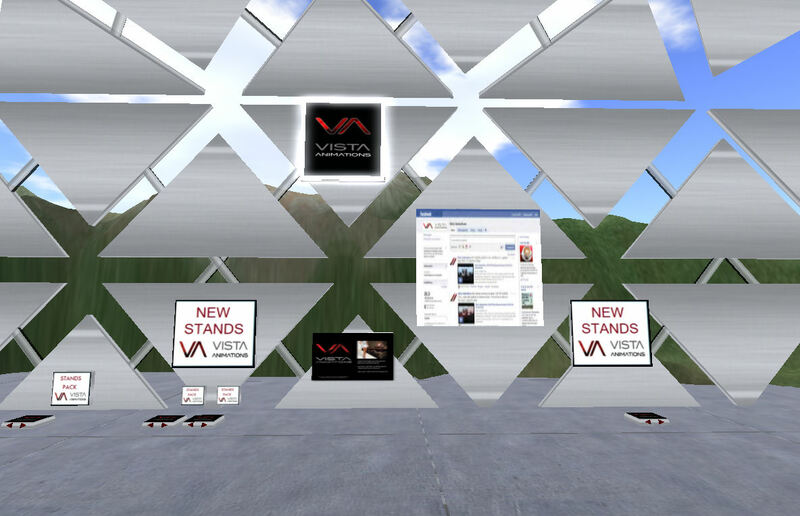 While people were focused on the announcement last week concerning InWorldz joint venture with CariNet, many of us missed an interesting snippet coming out of Avination by way of Maria Korolov’s excellent Hypergrid Business. In an article by Maria, Melanie Thielker of Avination (and who also heads-up OpenSim hosting company 3D Hosting) confirms that her company has entered into negotiations with Havok over the potential deployment of the company’s physics engine on the Avination grid. As those actively engaged in Second Life know, the Havok engine is used to provide physics capabilities on Second Life; if the negotiations between Avination and Havok are successful, then it could see Avination becoming the first OpenSim grid to deploy physics of a standard comparable to Second Life – something that could give the company a strategic edge in gaining user-take up, especially in the areas of combat and role-play, which Aviation is geared towards already. This is not the first time Avination has taken the path trod by Linden Lab; as Maria points out, in March of this year, Avination became the first OpenSim grid to offer Vivox voice capabilities. Again, given the widespread use of Vivox (Eve Online, EverQuest and others online games use the system as well), Avination opted for a product with a solid track record that is an excellent fit for their product. And they did so without having to pass on costs to their users. Obviously, there are alternatives to both Voice and physics. In the case of Voice, there is Freeswitch and Whisper/Mumble, for example, although these have disadvantages in terms of reliability and usability. Physics-wise, there are open-source alternatives, as currently used by Avination and others. However, both Vivox and Havok are widely regarded as the “gold standard” in their respective fields. Given this, Avination have demonstrated a shrewd approach to developing their platform and adding to its overall appeal both with Vivox in March, and now with Havok. It’ll be interesting to see how these latter negotiations pan out. Avination have launched a “try a sim” promotion. you can pick-up a 15K prim simulator for $40USD for the first three months, rising to their standard $60USD a month thereafter. The offer starts today and runs for an indefinite period. Builds from one discounted sim cannot be transferred to another discounted sim (so no $40-a-month sim hopping!). Avination is another grid-based virtual world that is making something of a splash. As I’ve taken the time to re-visit InWorldz, I decided it would only be fair if I took a first look at Avination. My first step was to sign-up via the very plush website (IW and others, take note!). If you want to keep your existing SL avatar identity, this is possible once you’ve signed-up – see below. The sign-up process is painless: you supply a first name, select a last name from a defined list and follow the prompts as given. If you intend to swap your avatar name for your SL avatar name, make sure you click on the link in the grey area to the right of the first page of the sign-up process & make a note of the Second Life locations where Avination Terminals are located (displayed as a pop-up window). One interesting step is that you are asked to opt to initially go in-world at either the general Welcome area or the Role-play Welcome area. 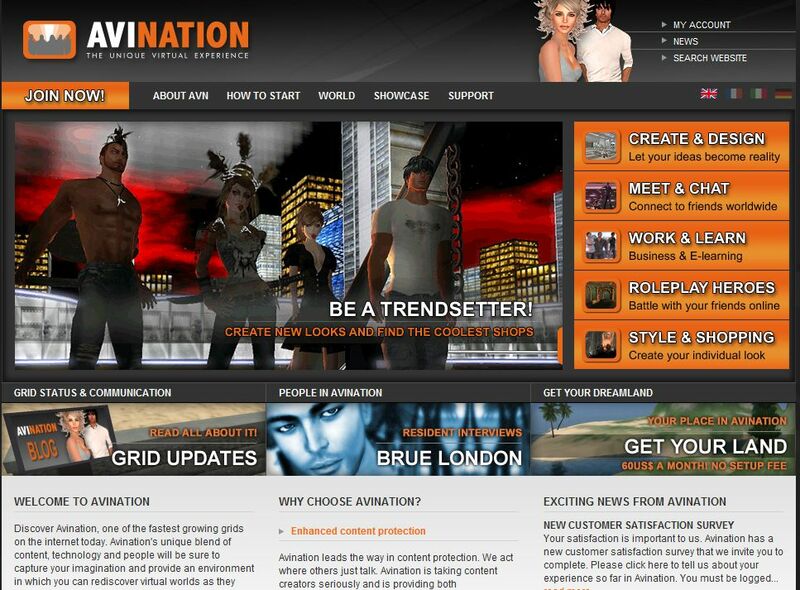 Unlike other Grids, Avination has been created to fill the niche market area of role-play (of which more anon). Once you have completed the e-mail verification process, you’re ready to log-into Avination. For this you can use the Aivation Viewer or a suitable SL Viewer 1.x TPV that supports multiple grids (I recommend Imprudence). To use your existing SL avatar name, log-in to your Avination account at the website and enter your SL name under the Account Details. Once you’ve done this, go in-world in Second Life and locate an Avination terminal where you can link your SL details with your Avination account, and then change your avatar’s name to that of your SL avatar. Once done, you can use your SL name to log into Avination via a Viewer or the web site. As a side note, be aware that you can also use these terminals to transfer L$ from SL to their Avination as well – although not the other way around. For the record, the system configuration I used for this review comprises: Intel Q6600 quad-core processor, 2.4Ghz / 3Gb RAM; Window 7 with SP-1 installed; Ge9800GT GPU with 1 GB RAM supporting OpenGL 3.3 & the most recent nVidia drivers; Imprudence 1.3.2 and Avination 0.1.0. On logging-in I arrived at the welcome area – a large plaza surrounded by shops. The people here were friendly, but there was a certain dearth of information on display. Surprisingly, when compared to elsewhere, I didn’t come across any freebies to help get newcomers started. OK the name of the game is commerce, but there is no harm in giving people the opportunity to improve their basic look before asking them to part with money to get a really good for themselves. I deliberately hung back on arrival, acting the newcomer and keeping quiet to see what the response would be – in InWorldz, there was a time when it could be overwhelming. Here, while the was a lot of chatting going on, it seemed to be among those who obviously knew one another, with new arrivals overlooked. However, a mentor did eventually take pity on me and passed over a notecard of landmarks. It was then time to sort out Inara Mark 3 and start exploring. Avination, unlike InWorldz, charges for uploads (C$10 each); this meant I needed funds – and I hit my first problem. While Aviation provide ATMs in SL to transfer funds to their grid, they don’t provide a direct exchange mechanism running the other way – you need to use a 3rd party solution. As the minimum transfer from L$ to C$ is L$1,000, and this was my first visit to Avination with no guarantee I’d be back, I frankly wasn’t willing to part with the funds. Had the exchange system been bi-directional, as with InWorldz, I wouldn’t have had an issue; but c’est la vie. This left me with the ability to create a new shape (the default shapes selected when joining at not modifiable), and keeping the default skin rather than uploading my own. While the result was reasonably OK, I was very conscious that it wasn’t really *me*, and I think this somewhat divorced me from the experience at times – as if I was looking at things through the eyes of a stranger, so to speak. However, the choice to go this route was mine, and as they say, beggars can’t be choosers; so off I went to explore. Aside from the list of LMs I was given, the sage advice I received when looking for stuff was to “use search”. Well, yes, if one accepts the fact that search suffers from the same plague as with other grids – and as SL once suffered: keyword gaming. It’s a trifle annoying typing in “hair” and getting dozens or more hits on everything and anything else but hair – but we lived with in it Second Life for years, so even this was a trip down memory lane – albeit with teeth clenched. That said, the search is more amenable than IW’s inasmuch as more tabbed categories work. Avination is perhaps the most “SL-looking” of the developing Grids I’ve visited. Like the others, Windlight is available, textures generally load fast in both Imprudence and the Avination viewer, builds are comprehensive and well-made, and so on. But it is more than that when it comes to the “SL feel”. For a start it is hard not to go too far before you trip over established names throughout Avination. Many major content creators from all fields are active here, and the range of “known” names seems to be far wider than that found in InWorldz. There is also the fact that gaming and gambling are a lot more settled in Avination. This is not to say they don’t exist in IW or elsewhere, just that their presence is more obvious here. In this, Avination very much feels like SL circa 2007 – and it’s actually a pretty warm feeling, another trip down memory lane. Prices in Avination are comparable to SL in many areas – and may even be cheaper in some. The C$ itself is worth about the same as the L$ in real terms. Hair, for example, can be had for around C$50-C$100 (compared to L$150-L$200 in SL), while boots and shoes seem to fall I the C$150-C$300 and clothes range anything from C$150 through to C$500. As mentioned above, there is a direct mechanism for getting money from SL to Avination via a series of SL-based ATMs. Once your accounts are linked between the platforms, the transfer is direct: simply pay an ATM for funds to move from L$ in SL to C$ in Avination. The minimum transfer amount is L$1,000 and the ATMs provide a fast pay pop-up for multiples thereof, as well as allowing you to enter any reasonable amount over the L$1,000 mark. However, getting money from Avination and back to Second Life is not as straightforward. There are no corresponding terminals in Avination. Instead, the recommended route is to use the Virtual World Exchange (VirWoX). VirWoX is internationally recognised as a currency exchange mechanism (L$ are traded on it) and can offer great flexibility of use. However, VirWoX requires an account registration and credit card, etc., details – and it is conceivable that this will put casual visitors and some potential users off. A direct ATM system would be far more preferable. In terms of tier, Avination closely matches Inworldz prices: a full sim costing $60USD a month to lease (the same as an InWorldz mainland sim); however, there is no initial set-up fee payable. Full sims have 15,000 prims available, a-la Second Life, and prims can be stretched up to a maximum of 256x256x256m. While the prim count is lower than IW, this shouldn’t necessarily be seen as a point against Avination; we’ve yet to see how a sim with, say, 20-25,000 textured prims such as in an urban environment or on a rental sim and with multiple users (12+ avatars) routinely in the sim impacts Viewer lag. Aviation also offers a combat role-play ready sim with the CCS system for $75 a month, matching InWorldz private island rate, but again with zero set-up fee. There is also an “XP upgrade” CCS sim available at an extra $50 a month – although what this includes is something I didn’t discover during my couple of days wandering around. Rental costs on private sims are, as one might expect given the above prices, considerably lower than SL, even taking into account the owner’s own margin. A full sim can be rented, for example, for around C$3800 a week on average (compared to SL’s L$22,000 a week). As with InWorldz, Avination has adopted the SL maturity rating system (PG. Mature, Adult), allowing a wide range of activities to take place in-world. It is also RLV (or RLV/a) enabled, so offers a further alternative for adult-themed play. Avination is remarkably stable. I encountered precious few problems running either Imprudence or the native Viewer. In terms of frame rates, the Avination Viewer ran at between 28-30fps when I was alone on a sim, dropping to around 14fps on a sim with 10 people (Welcome Area). Imprudence offered up very similar rates. When I did try Phoenix, things weren’t quite as smooth: fps was around 12 when on my own, and fell to 5-6fps if anyone else was on the same sim. Rezzing within Phoenix was also generally slower. One minor problem I did encounter was that under Imprudence I could not influence the local time of day settings (unless I used Windlight defaults); setting the sun to sunrise, sunset or night had absolutely no impact on my world view. The same problem wasn’t apparent in the Avination Viewer, however, which handled daylight changes perfectly. A more annoying issue I had when using the Aviation Viewer was that sometimes on clicking vendor boards, etc, (to check / compare prices), and as I didn’t have sufficient funds to cover the cost of items, the “Buy currency” pop-up would be displayed. While this wasn’t in itself much of a surprise, the fact that 50% of the time closing the pop-up resulted in a Viewer crash was. Avination has a credible physics engine, something vital for role-play and which gives it an edge over other offerings. I’m assuming this is a tweaked offering, rather than the default ODE engine supplied with OpenSim. Lag was generally less noticeable than with InWorldz, and region crossings were very stable; a slight pause on crossing the boundary, nothing more – certainly no rubber banding. Would that SL was as smooth. Tattoo and Alpha Layers are supported, with the same limitation of only being able to wear a single layer of each that is common to all Viewers based on the SL 1.x code. Voice is also full enabled – something that can be very beneficial in role-play situations. An attractive element of Avination is the website – which is largely very well designed and informative, although it could benefit in having Surls in the Showcase section. While descriptions of various groups and businesses good to have, providing links to them would be very useful, even if one needs to copy-and-paste them into the map to make use of them (if live linking to a map a-la SL isn’t possible). 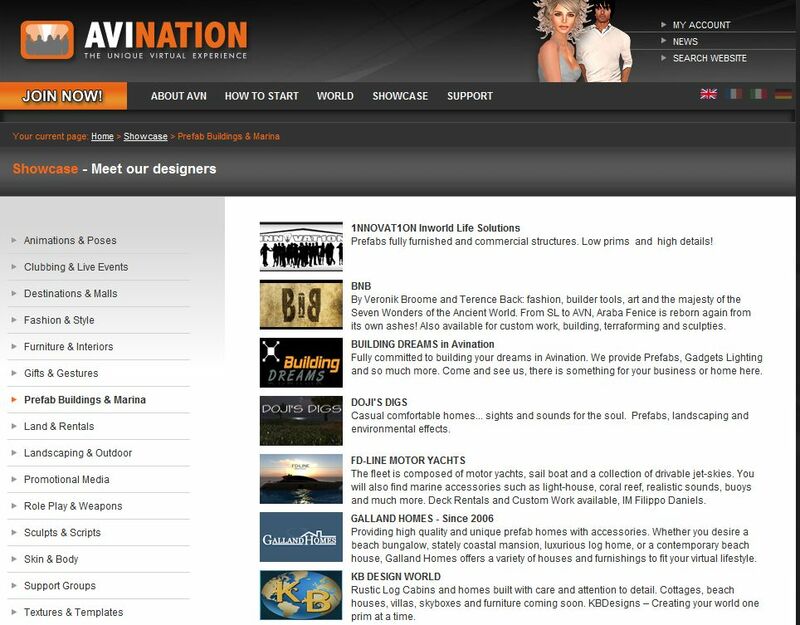 As with Inworldz, Avination has an active and engaging forum section on the website, which is also very well worth a look. Aviantion is run by Avination Virtual Limited, registered in the UK (Company Registration Number 07476485), and details of the individuals responsible for it are available on the website. There is a policy on content rights and protection which demonstrates that IP and other rights are taken as seriously as possible. Melanie Thielker, Avination’s CEO is well-known in OpenSim circles, adding further credibility to an already strong identity for the organisation. Avination is very much like InWorldz in many respects, but with more of a “Second Life” feel to it than I found with InWorldz (and this is not meant negatively either way). Like InWorldz, Avination is growing, but is nowhere near comparable to Second Life. Avination appears to have been somewhat more marketing-oriented than other grids; at the start of 2011 it engaged in an aggressive drive which saw the grid triple in size in terms of both regions and users in the space of a month (mid-January through mid-February); with regions topping out at 925 and user registrations at just a touch under 12K. Today these figures stand at 1042 regions and 30526 registered users, with some 7652 unique user log-ins every 30 days, giving an average daily concurrency of some 255 users. It’ hard to say precisely how this compares to InWorldz – which is not given to publishing monthly usage figures – but the overall user registration counts are roughly comparable at this time, with InWorldz just having the edge. Like IW, Avination does face an uphill struggle to entice people who have been entrenched in Second Life to make the leap across to the grid and start investing their money in it as consumers. While an aggressive marketing campaign earlier in the year did spark a rapid growth as mentioned above, it would appear this has levelled-off somewhat of late. Getting people who are engrossed in SL both mentality and financially to shift focus – even part-time – is not an easy nut to crack, as I’ve mentioned in my look at InWorldz. And with due respect to both Avination and InWorldz, the problem is further exacerbated in that while they both strive to be different and apart from SL, to the average user the differences may well appear cosmetic. When it comes to moving around, shopping and buying things, engaging in social activities, playing games, etc., there really isn’t that much of a difference. And this is where things might work against Avination and InWorldz. Not only have people invested a lot of time and money into their SL inventories, the fact that they can buy exactly the same stuff elsewhere isn’t necessarily an enticement for people to voluntarily uproot and leave SL, not even for the promise of lower tier – not unless LL go and do something unbelievably stupid to drive people away. That said, one thing that might make Aviation a more attractive proposition to SLers who do pop over to give it a try would be a fully in-world bi-directional means of passing funds between L$ and C$ accounts without the need to go through an exchange mechanism like VirWoX. Doing so could well entice them to start spending in Avination – and thus giving them a reason to come back again later. A lot of work has been put into making Avination a polished, professional package – and if I’m honest here, the likes of IW could learn a lesson or three from Avination in terms of website content and dynamics. This alone may help boost the numbers of people willing to get involved in it: attractive websites tend to, well, attract. It’s fair to say that Aviation is an attractive proposition for those wishing to engage in the “business” side of grid-based virtual worlds beyond Second Life as well as to the role-play community. Not only is the company offering sims at prices that are somewhat lower than the likes of InWorldz (no set-up fee), they are part of a triumvirate of companies run by the Thielkers – the other two being a virtual environment software company and a hosting service (3D Hosting, operating out of Germany). The latter two companies have been in existence for over two years, and together provide Avination with a strong technical base and potential security against being held to ransom by third-party hosting services, etc. Overall, I like Avination; it may not have given me the same buzz as InWorldz does, but it is a pleasant enough place and there is a lot going on. I can’t say I’ll be actively involved there – most of the people I know who are looking at other grids are, to be honest, sitting in InWorldz. Nevertheless, if you’re just beginning to venture out into the big wide world of grid-based virtual worlds, Avination, alongside InWorldz, is a good place to start. As has been pointed out, one element I failed to mention above is the fact that like InWorldz, it is possible to buy currency via the website, using Paypal & ICE (cheques). This was not a deliberate exclusion on my part; rather it was a simple oversight.